This cozy little suite on Mercer Island is the perfect escape for a couple looking to stay close to Seattle while being away from the bustle of the city. 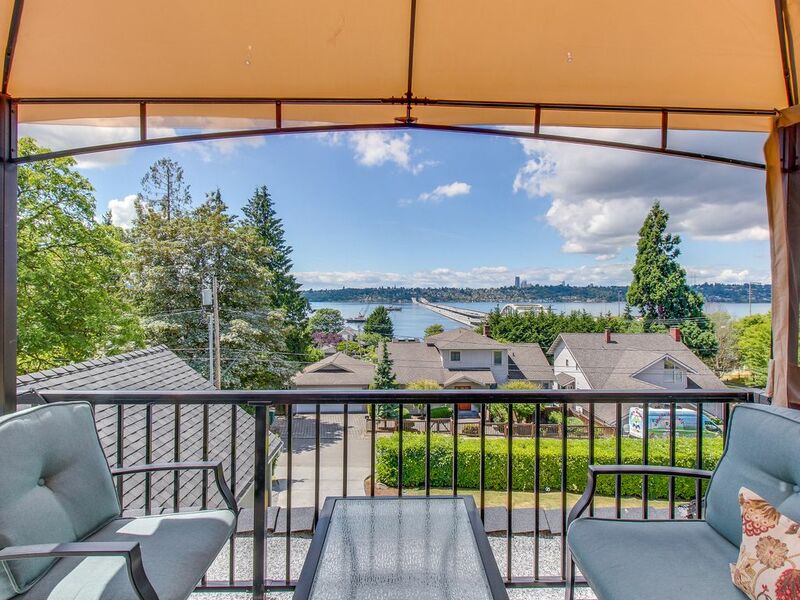 It boasts beautiful views of Lake Washington and the city skyline in the distance, a sunrise simulation alarm clock, as well as access to a shared hot tub out on the deck for relaxing after a long day. This condo is close to a walking path along the lake, which is perfect for morning and evening strolls. It is a short drive across the bridge to downtown Seattle, where you'll find plenty of shops, restaurants, and cultural attractions to fill your days. Parking Notes: Parking is available on the gravel along the side of the house. This was the perfect spot for our visit. It was a very clean room on a quiet street, very comfortable bed, and a great location for morning walks or runs. There was an issue with the heat the first day, but Vacasa responded to it immediately. My only caveat: It would be good if there was more drawer space for clothing and more hangers. Very private and secluded escape; really convenient access to I-90, Seattle, or Bellevue! The property was advertised as being 660 sqft, however in reality it was only about 225 sqft which is smaller than a standard hotel room. Additionally, there weren’t any hangers in the closet, no iron, no ironing board, and no information to connect to the secured WiFi. I will find an alternative property to stay next time.